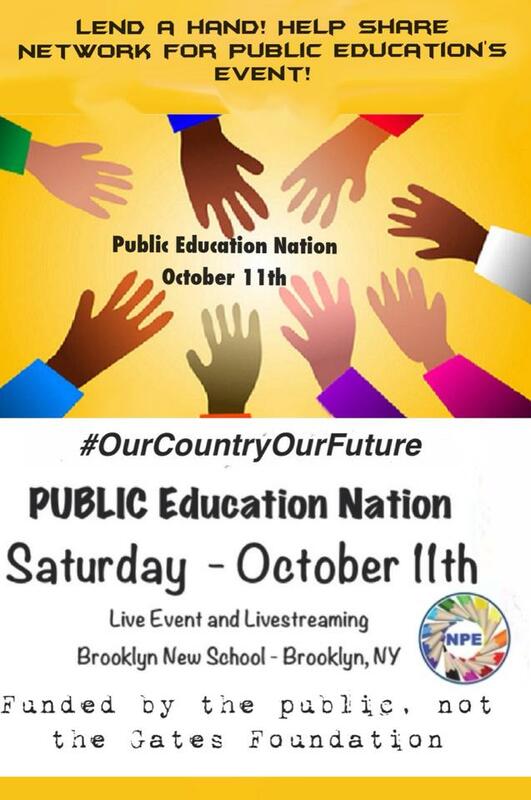 PUBLIC Education Nation will deliver the conversation the country has been waiting for. Rather than featuring billionaires and pop singers, this event will be built around intense conversations featuring leading educators, parents, students and community activists. We have waited too long for that seat at someone else’s table. This time, the tables are turned, and we are the ones setting the agenda. This event will be livestreamed on the web on the afternoon of Saturday, October 11, from the auditorium of Brooklyn New School, a public school. There will be four panels focusing on the most critical issues we face in our schools. The event will conclude with a conversation between Diane Ravitch and Jitu Brown. New York Principal of the Year Carol Burris will lead a discussion with educators Takeima Bunche-Smith, Rosa Rivera-McCutchen and Alan Aja. Chicago teacher Xian Barrett will moderate a panel featuring education professor Yohuru Williams, Hiram Rivera of the Philadelphia Student Union, and a representative of the Newark Student Union. North Carolina writer and activist Jeff Bryant will host a discussion that will include New Orleans parent activist Karran Harper Royal, New York teacher and blogger Gary Rubinstein, and Connecticut writer and activist Wendy Lecker. The fourth panel will be led by Network for Public Education executive director Robin Hiller and will include New York teacher Brian Jones, and from Cincinnati, Greg Anrig. This event will be broadcast live on the web, and can be viewed from anywhere in the world, at no cost. No registration is required. If you happen to be in the New York area, you can join the studio audience at the Brooklyn New School, at 610 Henry St. Brooklyn, for the live event. The Network for Public Education is hosting this event. It is NOT sponsored by the Gates, Walton or Bloomberg foundations. It is sponsored by YOU, each and every one of the people who care about our children’s future. Can you make a small donation to help us cover the expense of this event? We are determined to create the space not ordinarily given to voices like these. But we need your participation. Please donate by visiting the NPE website and clicking on the PayPal link. This entry was posted in Investigating Choice Time: Inquiry, Exploration, and Play and tagged Alan Aja, Brian Jones, Brooklyn New School, Carol Burris, Diane Ravitch, Gary rubinstein, Greg Anrig, Hiram Rivera, Jeff Bryant, Karran Harper Royal, Network for Public Education, New ark Student Union, Philadelphia Student Union, Robin Hiller, Rosa Rivera-McCutchen, takeima Bunche-Smith, Wendy Lecker, Xian Barrett, Yohuru Williams on September 25, 2014 by Renee. No fun in Kindergarten? We are in trouble!